from their behavior of hovering around flowers. 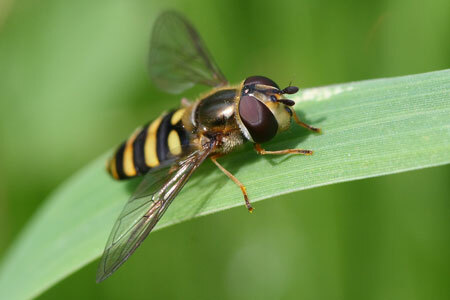 Hoverflies typically have black and yellow stripes, much like bees, and wasps as a form of protection. Because of their appearance, they can often be mistaken for a bee or a wasp. This acts as a form of camouflage and helps the hoverfly avoid potential predators who think that they have the capability to sting. They do however only have two wings, while the bee and the wasp have four. They are also important in pollinating flowers, and are natural enemies of pests. Because of this, farmers have been using them for biological control, a form of pest management. 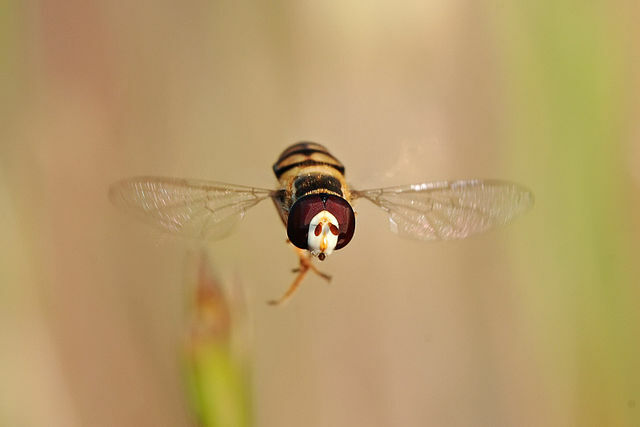 Similar to most of the insects that hover, the hoverfly hovers while feeding. They do however use it for a different purpose as well. The hoverfly uses their ability to hover to attract mates. The longer the male can stay hovering, and the stability of the hovering, are key components for mate selection among hoverflies. The stability of the hoverfly when hovering is quite amazing to say the least. When hovering, the hoverfly is constantly adjusting its wing pattern and frequency in each wing so that it may stay in the same location, even when it is windy. As a whole, hoverflies are one of nature’s most impressive flyers, as they possess the ability to hover and fly backwards. This can be attributed their flexible and versatile wings. Hoverflies actually have the most flexible wings out of any flying insect, as they twist their wings 45 degrees over 300 times every second. This flexibility in the wing allows it to have an ideal angle of attack throughout the whole up and down stroke, and is ultimately the reason why they can hover. Leading edge vortex is also important in the flight of the hoverfly as it is in the flight of all insects, especially since insects are not supposed to be able to fly under the conventional laws of aerodynamics. The leading edge vortex is a vortex created by the leading edge, which creates a lower pressure on the top of a wing, which in turn adds to the overall lift.